Darcy DeCoste has a long history of motorcycle dirt and road racing. As a rider and racer Darcy competed at the club level, but later progressed in the 90's to working with several riders on the AMA Pro motorcycle racing circuit as a tuner and engine builder. Years of development with Honda RS125/250, Yamaha TZ125/250 and Aprilia 250 road racing engines and Honda, Yamaha, Suzuki, and Kawasaki motocross engines have provided a deep understanding of 2 cycle racing engines. Simultaneously Darcy and his brother Vernon operated their family's machining and manufacturing business. This extensive experience in metalworking and machining gives DDR capabilities beyond a typical engine builder! 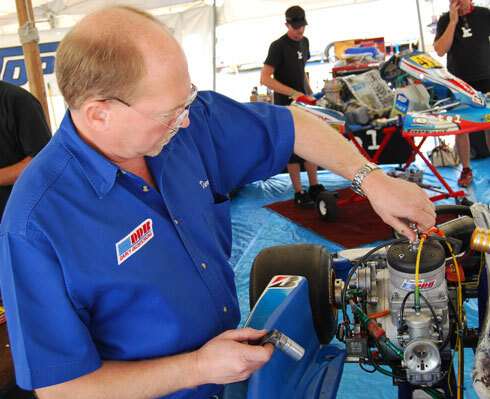 A friend asked asked Darcy to help him with his son's shifter kart engine in 2000, as he was aware of his experience with motorcycle racing engines. This project proved to be enormously successful winning several races! Word began to spread about Darcy and the motors he built. In 2001 Joe Friedricks asked Darcy to commit to an engine development program for JAF Racing as they pursued a SKUSA SuperPro title with Phil Carlson as the primary driver. Darcy was impressed with the "new" 2001 Honda CR125 and selected it as the engine of choice, while others shunned it in favor of the 1999 engine. Darcy DeCoste Racing officially began in 2002. The hard work began to pay off with the start of the SKUSA ProMoto Tour. Phil Carlson and JAF Racing with DDR power won SuperPro National Championship - the most prestigious title in U.S. shifter kart racing. Darcy DeCoste Racing continues to supply innovative kart racing engines, and the Power to Win!